Hey guys! For you new Terriers out there, I hope all of you have had a great first week of school! I know I have. So far, one of my favorite things about my classes is that they all seem to overlap—the things that I’m learning in one class inform the things I’m learning in another. For me, that’s awesome. One of the best things about COM is that everything is related, which shows what a truly well rounded education it provides. For example, I’m currently taking a history class called American Pop Culture, which spans the Victorian Era to the present day, or in other words, Vaudeville to “Jersey Shore.” Right now we’re talking about the early 1900’s, and how the Industrial Revolution created the concept of leisure time. One thing that people in the 1920s and 30s would do for leisure is listen to the radio. Approximately 4 hours later, I’m sitting in my Understanding Television class, learning all about the birth of the radio and how it served to unify the nation in times of hardship. We also learn about how at a certain point, advertising agencies really dominated radio by creating product-sponsored shows. The next morning at 8 am, I listen to my professor talk about the early days of product integration in my Intro to Advertising class. Hope all of you guys are enjoying your classes as much as I am! Hey guys, guess what? SCHOOL STARTS SO SOON! While I’m pretty sad that summer is coming to an end, I also can’t wait to get back to Boston in just about 20 days! The first few weeks as a college student were definitely a tough adjustment. It seems like everyone is wearing their favorite band T-shirts, desperate for someone to walk up and say, “Hey, you like the Jonas Brothers too?! So do I! LET’S BE BFFS! !” But, just remember that you aren’t the only person feeling a tad lonely—everyone is starting out the same way, hoping that someone likes the Jonas Brothers just as much as they do. Everyone is looking to make friends, so don’t be afraid to step out of your comfort zone and introduce yourself. The best way to do this is to join a club! Think about it: by joining a club, half the work is already done—you know that the people who signed up for the same club have to have something in common with you! At the beginning of the school year, BU holds an even called SPLASH, which is an enormous club fair held on Nickerson Field. As a freshman, I was totally overwhelmed. There are just SO many clubs and organizations to get involved in; you might feel a bit lost. I did, and I ended up waiting until second semester to really commit to anything. When I finally joined BUTV in the spring as a production assistant for the soap opera Bay State, I totally regretted my decision of not starting earlier. It was clear that it’s the best and most fun way to meet people. So do some research, sign up for anything that seems fun, and stick with one or two things. Don’t waste time like I did! See you all so soon! Hey there Class of 2016! I hope all of you have been relaxing and getting excited for the fall during these summer months! I’m sure some of you are feeling some anxiety, nerves, and maybe even dread at the prospect of leaving for college in a couple of months…I know I was just a year ago. But don’t worry, this summer, all I can think about is how awesome my freshman year was, and how excited I am to get back to Boston! This summer I’ve been experiencing some change in the scenery. For one thing, coming home to Miami after spending the Spring semester in Boston was quite a change. Those who have never experienced summer in Miami might believe it’s the perfect summer destination, with the sunshine, the beaches, and the tropical landscape. At those people, I laugh. Most of the time during the summer, temperatures reach close to 90 degrees, with 90-100% humidity, overcast skies, and scattered thunderstorms. Almost every day my friends and I wanted to work on our tans on South Beach, go for a bike ride in the Everglades, or have a nice day at the pool. The on-and-off rainstorms kinda put a damper on those plans. So, to be totally honest with you guys, I spent most of my time in Miami watching a lot of movies with my friends. Which, of course, I did not mind one bit. My summer has also taken me to Panama to visit my mom’s side of the family. Being half Panamanian, I absolutely LOVE going to the place where my mom grew up, spending time with my aunts, uncles, and cousins, and going to our family’s weekend home in the beach community of Coronado. To me, our house in Coronado is paradise. My grandparents built our small house right on a cliff that slopes down to the beach, complete with a pool, a hut overlooking the ocean, and lots of room outside for the kids to run around. While in Coronado, I get to spend quality time with my family as we take walks on the beach, visit our horses and other animals on our farm, and tell hilarious family stories in hammocks under the stars. Doesn’t that sound perfect?! Spoiler alert: it is. Finally, my last change of scenery for the summer before heading back to Miami is my current location: Blowing Rock, North Carolina. Blowing Rock is a quaint mountain town where my parents and I have been vacationing almost every summer since I was two. While I’m here, I transform into the definition of outdoorsy. If you know me well, that last sentence would make you laugh out loud. But hey, something about the mountain air just brings out the hiker, biker, and kayaker in me! My favorite outdoor activity that we do every year is the 17-mile bike ride down the Virginia Creeper Trail. The trail used to be home to an old railroad track, and travels through the woods near Damascus, Virginia. It’s absolutely gorgeous, flying by on your bike past creeks and woodland creatures and crossing over beautiful bridges. When I’m not outside, becoming at one with nature, I’ve been eating absurd amounts of Kilwins ice cream, reading Game of Thrones, watching House Hunters International marathons, and anxiously awaiting my flight back to Boston in September. Anyway, before I get all nostalgic and sentimental like I do, I’d like to talk about one of the best resources COM has: the academic advisors. At COM Student Services, we have five incredible academic advisors for students to make appointments with throughout their four years at BU. You can meet with them about planning your schedule, planning your study abroad, or anything that relates to your academics at BU. Last week I had my first advising appointment. With registration coming up this Sunday for rising sophomores, I thought it would be a good idea to check in and get some advice about what classes I should take. In my meeting with Ryan, one of our advisors, I learned that I have enough AP credits and foundation requirements to take two COM classes next semester (Intro to Advertising and Understanding TV), along with a really awesome higher-level history course (American Pop Culture), and I have the possibility of studying abroad, twice! (I’m thinking London and LA, but we’ll see what happens). I never would have known about these possibilities if I hadn’t gone to meet with one of our advisors at COM. So when you’re on campus next year and just want some advice on what your path should be academically, don’t be afraid to come to Student Services and make an appointment. Our advisors—Ryan, Bryan, Katie, Bill, and Erik—really are the best. I would know. I work with them. Congrats again to all the members of the class of 2016! It was so great to meet some of you last Saturday at Open House, and I can’t wait to meet more of you this Saturday! See all of you next year! One of the biggest factors I considered when looking for the perfect school was location. Early on in my search, I was convinced that I wanted a secluded campus with lots of lawns, brick, and vines. However, that quickly changed once I arrived on Boston University’s campus. For me, BU was the perfect combination: it had that collegiate, campus feeling while being in the middle of a big, exciting city. Once I walked down Comm Ave for the first time, I decided that with my eyes set on a degree in Communication, I couldn’t pass up all the amazing opportunities being in a big city would offer me. Almost a year later (I can’t believe its gone by so fast), I’m absolutely positive that my decision was the right one. The fact is, through BU, COM, and the prime location, I have had so many opportunities that I wouldn’t have otherwise had if I had chosen a different school in a different location. Last night, my friend Anneliese and I hopped on the T right outside of our dorm and rode over the river to Cambridge. We were on our way to see a special screening of the movie Boy, a New Zealand film by director Taika Waititi, who also wrote and starred in it. Immediately following the screening, Waititi was there to do a Q&A. This was no ordinary night for Anneliese. Waititi is her favorite filmmaker, and inspired her love for the tiny country of New Zealand. Through the COM Study Abroad program, Anneliese plans on studying abroad there while having an internship in Film and TV. Because Boston is such a major city in the US, many filmmakers set their eyes on it for screenings and to help get the word out. Anneliese never thought that in her first year at college, she’d get the change to interview her favorite filmmaker from New Zealand. After contacting Waititi through Twitter, Anneliese was promised an interview with him after the screening for the profile she is writing on him for The Buzz, BU’s magazine. Putting her COM 201 Writing for Communication skills to work, Anneliese dominated the Q&A and impressed Waititi with her professional questions. The producer of the film was also there, and approached us after the session. “Are you doing an article?” he asked her, clearly noticing the preparation and care had gone into her questions. She explained that she’s writing a profile for BU, and the producer instantly offered to give Anneliese Waititi’s contact information so that she could get the rest of her questions answered. While we were calm, collected, and professional on the outside, on the inside, we were BURSTING with excitement. She even got a kiss on the cheek from Waititi! This is just one example of the incredible opportunities that come with studying in a major city. One more quick one: this past week, there was a pilot for a new ABC show filming—right on campus! Especially as a COM student, getting the chance to really put yourself out there and gain hands on experience in what you are studying is essential. COM encourages it, and so do I! Come see for yourself how awesome it is to go to school in Boston—our COM Open Houses for admitted students are April 14th and 21st. Hope to see you there! I was extremely skeptical about how great Twitter was. I swore I would never get one. That all changed once I got to BU. It quickly became clear to me that everyone and everything at BU had an online presence, especially on Twitter. This realization was also amplified as a COM student, where communication is everything. So, I caved. Even though I had made one months before, I rarely went on it and never updated. I started following more and more people and things, and was introduced to the wonderful world of Twitter. Contrary to my original belief, Twitter is not only a place for people to post pointless updates about what they were doing. There is so much information at your fingertips, including tips about all the cool things that are going on around Boston and BU. As a prospective Film and TV major, I follow the Film and TV department on Twitter (@BUFilmTV). At one point last semester, their Twitter updated that Professor Jaramillo was going to be giving a lecture on the topic of Race in Mad Men. As an enormous fan of Mad Men, I grabbed two of my friends and headed over to the African American Studies House. The lecture was so interesting and thought provoking, and it ended up being one of my favorite things that I did last semester. Without Twitter, I never would have known about it! Twitter is such a great resource for information. If you don’t already have an account, definitely consider getting one. You never know what you might find! 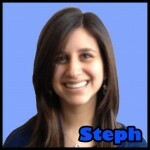 And now for some shameless self-promotion, follow me at @StephSemet! Located about 10 minutes from where I call home, Warren Towers, Regal Fenway is the perfect cure for the mid-week blues. My friends and I needed a break from homework one Wednesday night last semester and decided to walk over to the Regal Fenway and see 50/50. Even though 50/50 was an emotional rollercoaster, (I laughed, I bawled, I swooned over Joseph Gordon-Levitt), it was definitely awesome to be able to catch a quick movie on a weekday. So college. Coolidge Corner is one of the cutest areas I’ve seen around Boston, and the Coolidge Corner Theater doesn’t disappoint when it comes to cuteness. From the outside, you can tell that the CCT is a cultural landmark, with its neon lights and art-deco style exterior. If you’re dying to see that indie flick that isn’t playing anywhere else, chances are Coolidge Corner will be more than happy to indulge in your indie needs. You have to be prepared, though—my friends and I tried three times to go see A Dangerous Method starring the genetically perfect Michael Fassbender, and it was sold out every time, because it was playing in their 14 seat theater. Talk about intimate. Other fun stuff includes midnight showings of old horror movies and the cult classic Rocky Horror Picture Show. If the Coolidge Corner Theater were a one-bedroom studio, the AMC Loews Boston Commons would be a McMansion. The place is MASSIVE, and so beautiful. Not only does it have a concession stand that would satisfy any sweet tooth, it also includes an ice-cream stand where you can have custom-made milkshakes. As you make your way to your theater, constant reminders of why you love movies surround you. Famous movie quotes are painted onto the ceiling, and vintage movie posters advertising Star Wars, Indiana Jones, and James Bond are framed on the walls. Larger-than-life black and white portraits of Marlon Brando on the set of The Godfather and James Dean on the set of Rebel Without a Cause lead you to your seat. For someone who loves movies as much as I do, it’s a magical place. The Somerville Theater is a bit far off campus, but it’s definitely worth the trip. Located in Davis Square, the Somerville Theater is very reminiscent of Coolidge Corner Theater in terms of old-time charm. The main theater is a converted stage theater, complete with gold curtains and balconies. The other theaters are just as quaint, with light fixtures shaped like owls. And it isn’t just for movies—the Somerville Theater also continues to host live performances. And if you have some time after your movie, you can make your way downstairs to the Museum of Bad Art. Yup, it’s exactly what it sounds like. So if you’re craving some popcorn and a good movie, there are tons of options at your fingertips. See ya at the movies!